For other uses, see Squad (disambiguation). Not to be confused with Section, which might have sub-unit structure (7 to 12 soldiers, equivalent to squad) in some armies or platoon structure (up to 39 soldiers) e.g. in France, and not to be confused with Squadron. Standard NATO military map symbol for a friendly infantry Squad. In military terminology, a squad is a sub-subunit led by a non-commissioned officer that is subordinate to an infantry platoon. In countries following the British Army tradition (Australian Army, Canadian Army, and others), this organization is referred to as a section. In most armies, a squad consists of eight to fourteen soldiers, and may be further subdivided into fireteams. The equivalent to squad is the Gruppe, a sub-unit of 8 to 12 soldiers, in the German Bundeswehr, Austrian Bundesheer and Swiss Army. During World War 2 the German Wehrmacht infantry squad or Gruppe was mainly a general purpose machine gun (GPMG) based unit. The advantage of the general purpose machine gun concept was that it added greatly to the overall volume of fire that could be put out by a squad-sized unit. The MG 34 or MG 42 GPMGs were normally used in the light machine gun role. An infantry Gruppe consisted of ten men; a non-commissioned officer or Unteroffizier squad leader, deputy squad leader, a three-man machine gun team (machine gunner, assistant gunner and ammunition carrier) and five riflemen. As personal small arms the squad leader was issued a rifle or as of around 1941 a submachine gun, the machine gunner and his assistant were issued pistols and the deputy squad leader, ammunition carrier and the riflemen were issued rifles. The riflemen carried additional ammunition, hand grenades, explosive charges or a machine gun tripod as required and provided security and covering fire for the machine gun team. Two of the standard issue bolt-action Karabiner 98k rifles in the squad could be replaced with semi-automatic Gewehr 43 rifles and occasionally, StG-44 assault rifles could be used to re-arm the whole squad, besides the machine-gun. Historically, a "squad" in the US Army was a sub-unit of a section, consisting of from as few as two soldiers to as many as 12 and was originally used primarily for drill and administrative purposes (e.g., billeting, messing, working parties, etc.). The smallest tactical sub-unit being the section, which was also known as a half-platoon (the platoon itself being a half company). Depending upon the time period, the squad "leader" (not an official position title until 1891) could be a sergeant (the sergeant, in sections with only one corporal, led the section's first squad, while the lone corporal served as assistant section leader and led the section's second squad), a corporal (in sections with two corporals), a lance corporal (a rank the Army had in varying numbers and conditions from at least 1821 until 1920), a private first class (PFC) (the rank existing since 1846 but not earning its one chevron - taken from the abolished lance corporal rank - until 1920). or even a "senior" private (there being many long-service, or "professional," privates until the post-WWII era). In 1891, the US Army officially defined a rifle "squad" as consisting of "seven privates and one corporal." The US Army employed the eight-man rifle squad through WWI and until the late 1930s under the Square Division organizational plan, in which sergeants continued to lead sections consisting of two squads. Under the Triangular Division organization plan in 1939 rifle squads were no longer organized into sections. Instead, the squads were reorganized into a 12-man unit of three elements, or teams, Able, Baker, and Charlie, reporting directly to the platoon commander (an officer, usually a second lieutenant), assisted by a sergeant assigned as the "assistant to platoon commander" (re-designated as "platoon leader" in 1940 and as "platoon sergeant" in 1943 with the officer then re-designated as "platoon leader".) The squad leader was still only a corporal but the squad was also assigned a PFC (one of the scout riflemen) as the assistant to the squad leader. This soldier could serve as either the squad leader's messenger to the platoon commander or could be used to relay orders to other squad elements, as needed. While not a noncommissioned officer (NCO) the PFC was an experienced soldier, as prior to WWII the majority of enlisted men remained privates for the entire term of their enlistment since promotion opportunity was scarce. However, the obvious command (viz., leadership and supervision) weakness of so large a squad under one NCO rapidly became obvious in light of the pre-war mobilization and was corrected in 1940 when a second NCO was added to the squad. After WWII, in 1948, the Army decided to "downsize” the rifle squad to a nine-man organization (as well as realign its enlisted grade structure), as post-war analysis had shown that the 12-man squad was too large and unwieldy in combat. The squad leader was again called a sergeant (but retained the grade 3 pay grade and insignia of the rank of a staff sergeant, which was then eliminated.) The two scouts of the Able element were eliminated with the idea that all of the riflemen should be able to perform the scouting duties and would therefore all share in the associated inherent risk of that position. The Baker element's ammunition bearer was also eliminated, leaving the two-man BAR team as the base of fire, supervised by the assistant squad leader (again called a corporal), but remaining as a grade 4, since the rank of sergeant (three chevrons) was then eliminated. (PFC became grade 5, private was grade 6, and recruit was grade 7; PFCs wore one chevron and privates and recruits both wore none.) The five riflemen of the “Charlie” team, now led by the squad leader, remained as the maneuver element. In the 1956 the Army began reorganizing into its "Pentomic” plan under the ROCID (Reorganization of Current Infantry Divisions) TO&Es. The rifle squad was reorganized into an eleven-man organization with a sergeant (E-5) as squad leader and two five-man fire teams. Each fire team consisted of a corporal (E-4) team leader, an automatic rifleman, an assistant automatic rifleman, a grenadier, and a scout-rifleman. The assistant squad leader position was eliminated, with the senior fire team leader now filling this role as needed. Currently, US Army rifle squads consist of nine soldiers, organized under a squad leader into two four-man fire teams. The squad leader is a staff sergeant (E-6) and the two fire team leaders are sergeants (E-5). Mechanized infantry and Stryker infantry units are equipped with M2A3 Bradley infantry fighting vehicles and M1126 Stryker infantry carrier vehicles, respectively. Unlike the ROAD era mechanized infantry units, none of the vehicle crewman (M2A3 - three, M1126 - two) are counted as part of the nine-man rifle squad transported by the vehicles. The term squad is also used in infantry crew-served weapons sections (number of members varies by weapon), military police (twelve soldiers including a squad leader divided into four three-man teams, with three team leaders), and combat engineer units. In the United States Marine Corps, a rifle squad is usually composed of three fireteams of four Marines each and a squad leader who is typically a sergeant or corporal. Other types of USMC infantry squads include: machinegun (7.62mm), heavy machinegun (.50 cal. and 40mm), LWCMS mortar (60-mm), 81-mm mortar, assault weapon (SMAW), antiarmor (Javelin missile), and anti-tank (TOW missile). These squads range from as few as three Marines (60mm LWCM squad) to as many as eight (Javelin Missile squad), depending upon the weapon system with which the squad is equipped. Squads are also used in reconnaissance, light armored reconnaissance (scout dismounts), combat engineer, law enforcement (i.e., military police), Marine Security Force Regiment (MSFR), and Fleet Antiterrorism Security Team (FAST) companies. On 9 May 2018, it was announced that a USMC squad will be reduced to 12 Marines, with three fire teams of three Marines each with two new positions: an assistant squad leader and a squad systems operator. In the US Air Force Security Forces a squad is made up of three fire teams of four members each led by a senior airman or staff sergeant and either a staff sergeant or tech sergeant squad leader. In the Soviet Armed Forces a motorised rifle squad was mounted in either a BTR armoured personnel carrier or BMP infantry fighting vehicle, with the former being more numerous by the late 1980s. BTR rifle squads consisted of a squad leader/BTR commander, senior rifleman/assistant squad leader, a machine gunner armed with an RPK-74, a grenadier armed with an RPG-7, a rifleman/assistant grenadier, a rifleman/medic, a rifleman, a BTR driver/mechanic and a BTR machine gunner. BMP rifle squads consisted of a squad leader/BMP commander, assistant squad leader/BMP gunner, a BMP driver/mechanic, a machine gunner armed with an RPK-74, a genadier armed with an RPG-7, a rifleman/assistant grenadier, a rifleman/medic, a senior rifleman and a rifleman all armed with AKMs or AK-74s. Within a platoon the rifleman in one of the squads was armed with an SVD sniper rifle. In both BTR and BMP squads the vehicle's gunner and driver stayed with the vehicle while the rest of the squad dismounted. A squad is a term used in the US Fire and EMS services to describe several types of units and emergency apparatus. Oftentimes, the names "squad" and "rescue squad" are used interchangeably, however the function of the squad is different from department to department. In some departments, a "squad" and a "rescue" are two distinct units. This is the case in New York City, where the FDNY operates eight squad companies. These special "enhanced" engine companies perform both "truck" and "engine" company tasks, as well as hazardous materials (Hazmat) mitigation and other specialty rescue functions. FDNY's five "rescue" companies primarily mitigate technical and heavy rescue incidents, and operate as a pure special rescue unit. Squads and rescues within the FDNY are part of the departments specialty operations command (SOC). In other departments, a squad is a name given to a type of apparatus that delivers EMS and rescue services, and is staffed by firefighter/EMTs or firefighter/paramedics. This type of service delivery is common in the greater Los Angeles area of California, and was made famous in the 1970s show Emergency!, where the fictional Squad 51 highlighted the lives of two firefighter/paramedics of the LACoFD. The squad, 班, or section was the basic unit of the National Revolutionary Army (the Republic of China), and would usually be 14 men strong. An infantry squad from an elite German-trained division would ideally have one light machine gun and 10 rifles, but only one of the three squads in a non-elite Central Army division would have a light machine gun. Furthermore, the regular provincial army divisions had no machine guns at all. Ställföreträdande gruppchef -- Deputy squad leader. 2 soldater tillika kulspruteskyttar -- 2 machine-gunners. 2 soldater tillika pansarskottsskyttar - 2 riflemen with anti-tank launcher. (Typically the Pansarskott m/86). 1 soldat tillika skarpskytt. -- 1 marksman. 1 soldat tillika stridssjukvårdare -- 1 combat medic. 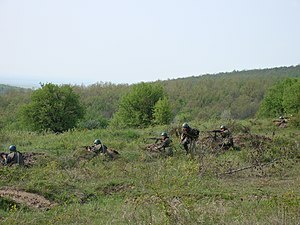 During defensive missions, the two soldiers with anti-tank launchers are armed with the Granatgevär m/48 or m/86 instead, where one is gunner and the second loader. A squad is led by an NCO known as a Squad Leader. His/her second in command is known as an Assistant Squad Leader. In Britain and in the Commonwealth, these appointments are known as Section Commander and Section 2IC ("second in command"), respectively. This article is about the military role. For the board game by Avalon Hill, see Squad Leader. In the military, a squad leader is a non-commissioned officer who leads a squad of typically 9 soldiers (US Army: squad leader and two fireteams of 4 men each) or 13 Marines (US Marine Corps: squad leader and three fireteams of 4 men each) in a rifle squad, or 3 to 8 men in a crew-served weapons squad. In the United States Army the TO&E rank of a rifle squad leader is staff sergeant (E-6, or OR-6) and in the United States Marine Corps the TO rank is sergeant (E-5, or OR-5), though a corporal may also act as a squad leader in the absence of sufficient numbers of sergeants. Squad leaders of crew-served weapons squads range from corporal through staff sergeant, depending upon the branch of service and type of squad. In some armies, notably those of the British Commonwealth, in which the term section is used for units of this size, the NCO in charge, which in the British Army and Royal Marines is normally a Corporal (OR-4), is termed a section commander. A Romanian squad of a TAB-77 APC. This is a typical Soviet arrangement, with a PK general purpose machine gun and a RPK light machine gun in the center and two soldiers with AK-47 assault rifles and one RPG-7 grenade launcher on the flanks. Another soldier provides liaison or extra firepower where needed. Brazilian Army: In the Brazilian Army, a Grupo de Combate is a platoon subdivision and is commanded by a third sergeant, as in a U.S. Army squad. French Army : The groupe de combat is normally led by a Sergent (Sergeant) or a Caporal-chef de première classe (first class master corporal). Norwegian Army: Sergeant (NOC is corporal and leads the light machine gun fire team of the squad). Portuguese Army: the esquadra (squad) is led by a cabo (corporal). Polish Army: The drużyna (Squad) is led by a sierżant (Sergeant). A squad can also be an ad hoc group of soldiers assigned to a task, for example, a firing squad. The Canadian Forces Manual of Drill and Ceremonial defines a squad as "a small military formation of less than platoon size which is adopted to teach drill movements. (escouade)" However, the Manual provides direction for drill movements to be taught in "movements," "parts," or "stages." The format of the commands in the manual has given rise to a prevalent belief in the CF that these stages are called "squads". This groupthink has such strength that phrases such as "for ease of learning, this movement is broken down into 'squads'", are commonly used during periods of drill instruction. In actuality, were the lesson being given to a platoon, company or parade, the word "squad" would be replaced by the appropriate unit. Thus, these stages, parts, or movements should not be referred to as "squads". ^ "squad". Dictionary.com. Online Etymology Dictionary. Douglas Harper, Historian. http://www.dictionary.com/browse/squad (accessed: September 17, 2017). ^ "Squad/Section". Gruntsmilitary.com. Retrieved 2013-10-17. ^ "US Army Chain of Command". Usmilitary.about.com. 2013-07-19. Retrieved 2013-10-17. ^ Delf, Stephen Bull; illustrated by Mike Chappell & Brian (2004). World War II infantry tactics: squad and platoon. Osceola, WI: Osprey. pp. 22–23. ISBN 9781841766621. ^ The German Squad In Combat. United States War Department, Military Intelligence Service, December 25, 1943. ^ Mahon 1972, pp. 20 & 56. ^ Mahon 1972, p. 56. ^ Mahon 1972, pp. 102-103, 106. ^ U.S. Army Field Manual, Figure 1-5: Infantry fire team and Figure 1-6: "The Infantry Rifle Platoon and Squad" (PDF). Department of the Army. March 28, 2007. Archived (PDF) from the original on June 2, 2012. Retrieved April 1, 2017. ^ "Marines announce changes to ground combat element aimed at improving lethality and agility". marines.mil. 2018-05-09. Retrieved 2018-08-12. ^ "Introduction to Rifle Squad" – via YouTube. Mahon, John K.; Danysh, Romana (1972). "Infantry Part I: Regular Army" (PDF). Army Lineage Series. Office of the Chief of Military History. Archived (PDF) from the original on March 4, 2016. Retrieved April 1, 2017. Wikimedia Commons has media related to Military units and formations by size. This page was last edited on 15 March 2019, at 01:35 (UTC).